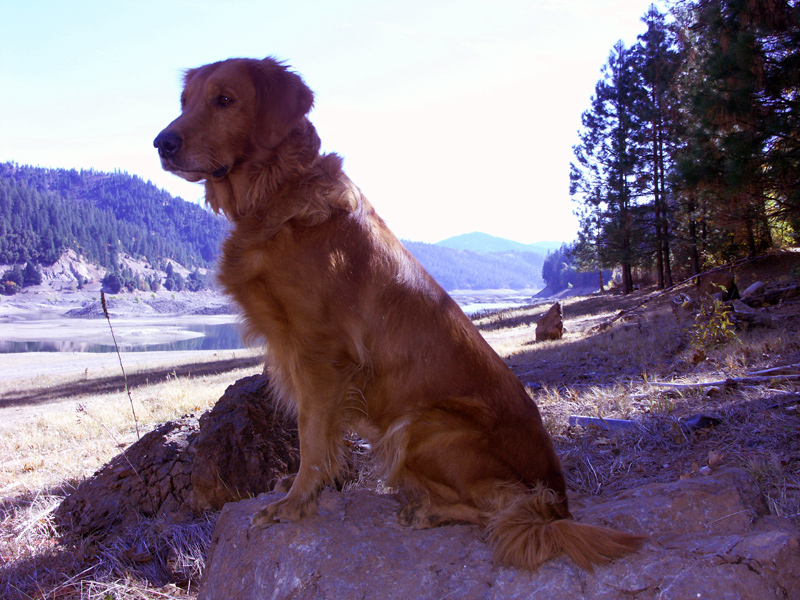 Nellie in her youth at Iron Canyon Reservoir. She is a smart pushy redhead and her name is Nellie. She is a 12 year old golden retriever. She belongs to our oldest son although she has continued to live with my wife and me since our son grew up and moved out on his own. She is very good at dog to human communications. If she wants out, she rattles the door knob with her nose. When it is 8:00 pm she comes and reminds me that it is dinner time, even after the time change. I’m not sure how she does that, but she does it without missing a beat. When I ignore her demands she shakes her head at me and stares as if she thinks I’m very dense. If I continue to ignore her she gives me a deep “boof.” She is quite a girl. Over eleven years ago she was running in the AKC Hunt Tests. At the time our son got Nellie we had an agreement with him. It was that he would have to earn a title with her. This was to insure that she was trained into a well mannered dog. So he ran her in the Hunt Tests. It was a little rough watching a Junior Handler running a Junior Dog. Inexperience in the case of the both accompanied by lots twitching and fiddling around sometimes made the events a little nerve racking to his parents. At one event, when the bird was thrown my son was messing with her lead and she didn’t appear to mark the falling bird. She dutifully ran across the creek, the long way around, and into the field. She looked about as if she didn’t have a clue where the bird was. Then she sat down. We could hear the gallery groan uncomfortably at the thought that this boy and his beautiful golden were about to fail this test. She looked around the grounds while she sat. The seconds slowly ticked away and we know the judges were about to tell him to “pick up” his dog. There was no point in continuing this embarrassing performance. Without warning Nellie stood up and ran straight to the fallen bird. She picked it up as if she knew where it was all along and delivered to my son. This was just one tense leg in a 4 series test, and at the end of the day they both passed the test. 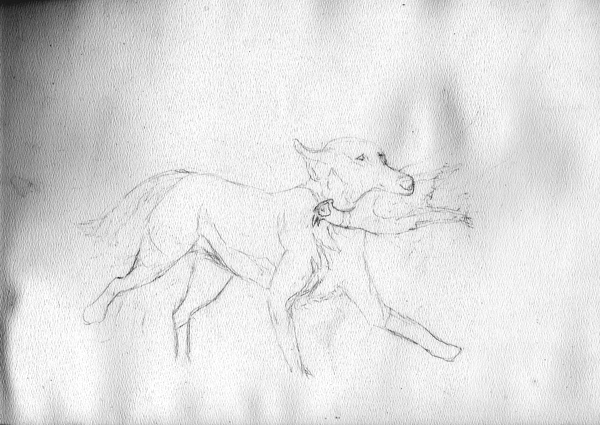 The original sketch I did for the watercolor of Nellie eleven years ago. Back at that time I started on a watercolor of Nellie. I sketched it out on a watercolor pad, but never got around to finishing it. Not long ago I came across the dusty sketch. I decided to work on it and post my progress on the blog along the way. Today I’m featuring the original eleven year old sketch. I hope not to embarrass myself with this process, but after all you know what they say, “paint like no one is watching” or something close to that. This entry was posted in The Foresters Canvas, Traveling Companions, Watercolors and tagged AKC Hunt Test, dog training, dogs, golden retriever, Hunt Test, Junior Handler, Junior Hunter, Nellie, watercolor by foresterartist. Bookmark the permalink. Yes, me too. There is never enough time to paint, but I will get something up this weekend. One job sometimes gets in the way of the other. So this sketch was there in the background for most part of her life, which I think is a beautiful thing. It was indeed. I never thought of it that way. Tim, the sketch on it’s own is wonderful. Even if you never get time to finish it, it’s a sweet memory. Thank you Terry. I actually did finish it. Take a look, https://theforesterartist.com/2012/11/23/nellie-in-watercolor-part-5-the-rattler/. Is this Terry WB?